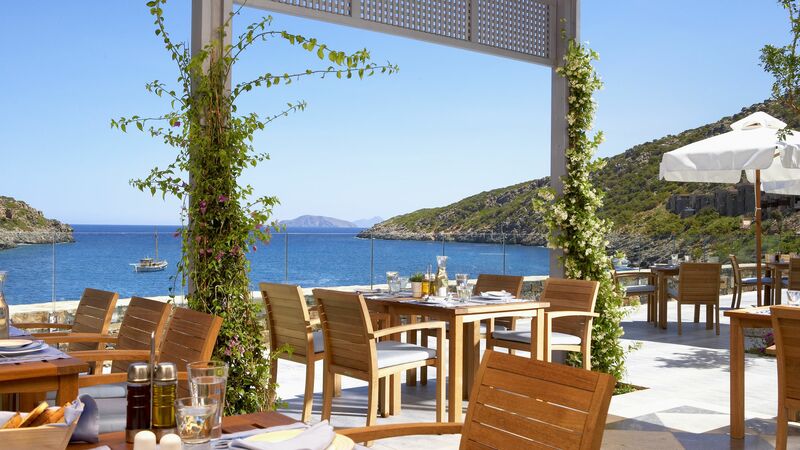 Daios Cove Luxury Resort & Spa is located in its own private cove, where guests can relax and take in the views of the glittering Aegean Sea. 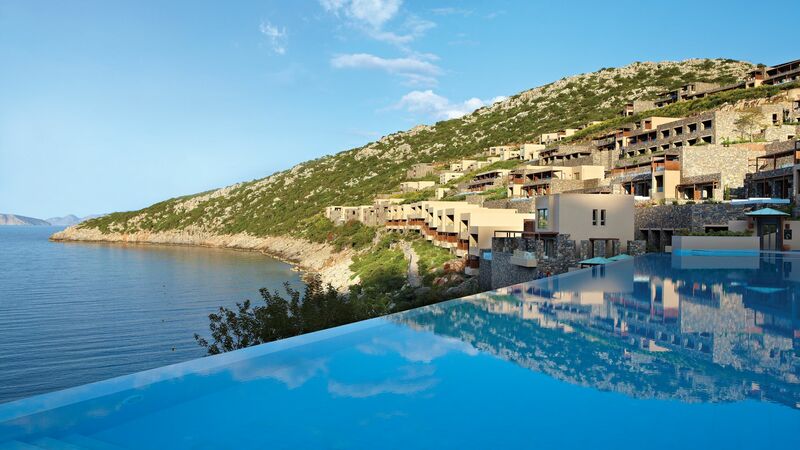 It’s home to a stunning infinity pool which overlooks the cove and offers sun loungers and a bar and restaurant. The beach itself has lounger service, as well as a range of water sports for more active guests. Families are well catered for, with high chairs in all restaurants, three Kids’ Clubs, a babysitting service and much more. Couples can spend their days relaxing in the spa, enjoying a massage for two as they overlook the beautiful cove from floor length windows. When it comes to dining you’ll be spoilt for choice, with opportunities to learn to cook your own delicious traditional dishes as well. Hotel child prices apply to ages 2–13 years. The hotel has 290 rooms, suites, and villas. Guests booking in suites and villas can benefit from the Premium All Inclusive Residents’ Club. You can enjoy lunch and dinner at all restaurants, à la carte menus, selected drinks and cocktails, a bottle of wine with every lunch and dinner, ice cream, soft drinks and fresh fruit for children, complimentary 24-hour room service and your minibar stocked with wine, prosecco and a range of soft drinks, replenished daily. Seasonally grown produce is used to create delicious East Asian and Mediterranean inspired dishes. If you fancy a drink, relax to the sound of the waves mixed with the laid back sound system of the bar as you overlook the sparkling sea. Choose from dishes from around the world as you soak in the ambiance of the restaurant and take in beautiful views from floor length windows. Based on a traditional Greek taverna, this restaurant serves up delicious traditional fare, including fresh fish and local wines. Dine al fresco to take in the glorious views of the sea. 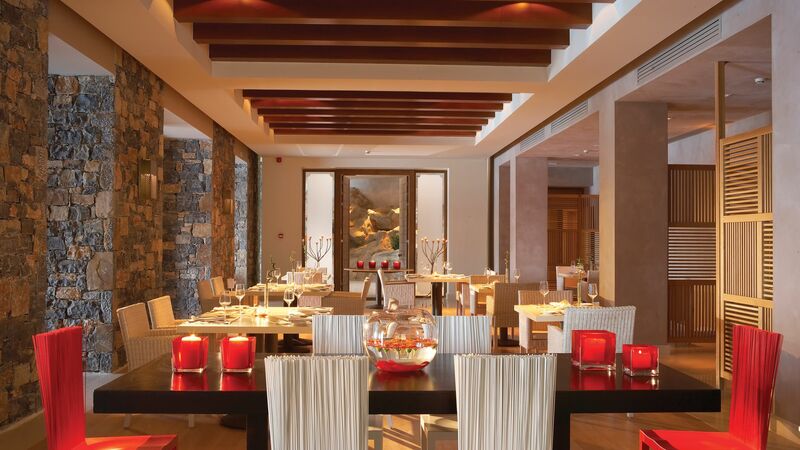 This contemporary restaurant allows you to experience delicious Mediterranean seafood dishes at their finest as you overlook the hotel’s swimming pool. This trendy bar enjoys a hilltop location, overlooking the bay. Enjoy cool music and colourful cocktails as you relax in the evenings. Enjoy drinks and snacks throughout the day in the contemporary atmosphere as you overlook the swimming pool and private cove. 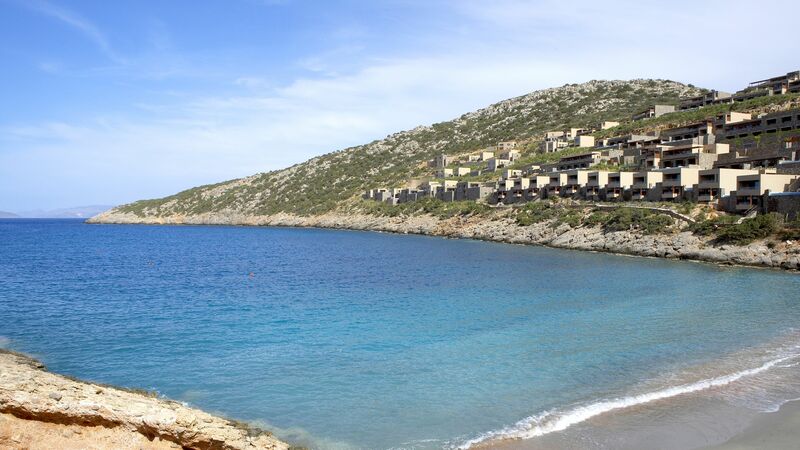 Daios Cove Luxury Resort & Spa has its own private cove, which is protected by surrounding hills and offers golden sands full of sun loungers. There is also a beach bar, with lounger service available. 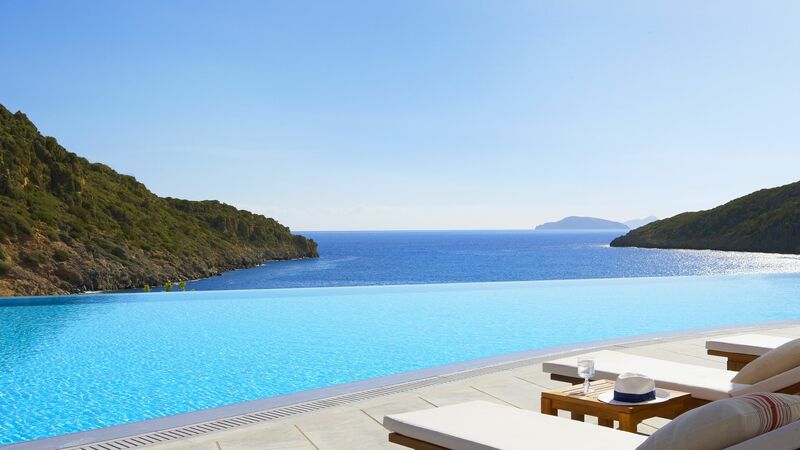 The hotel’s heated seawater infinity pool overlooks the beautiful Aegean Sea and offers opportunities to relax, with a terrace with sun loungers, a towel service, poolside bar and more. A section of the pool is reserved for children. The littlest members of your family will be taken care of throughout the day by expert staff at the crèche. Games and activities including cuddly toys, finger painting, dancing, and more. The Crèche is available at an extra cost. 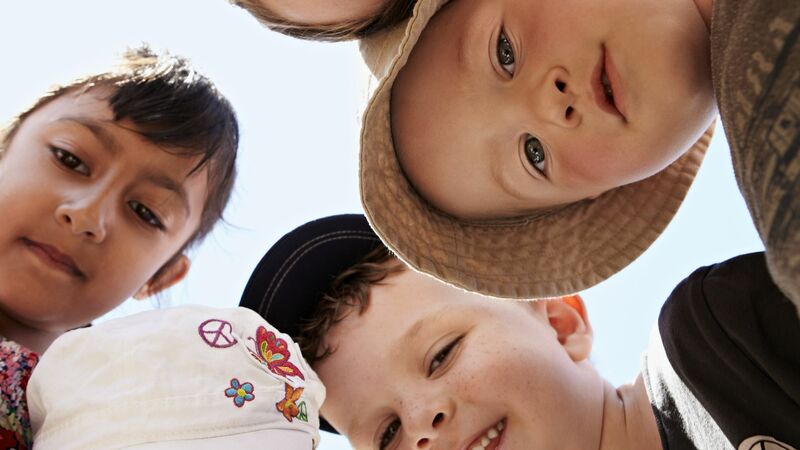 Little ones can play and make friends all day, with expert staff on hand to organise activities. Older children are well catered for, with a range of activities and games run by the expert staff throughout the day. 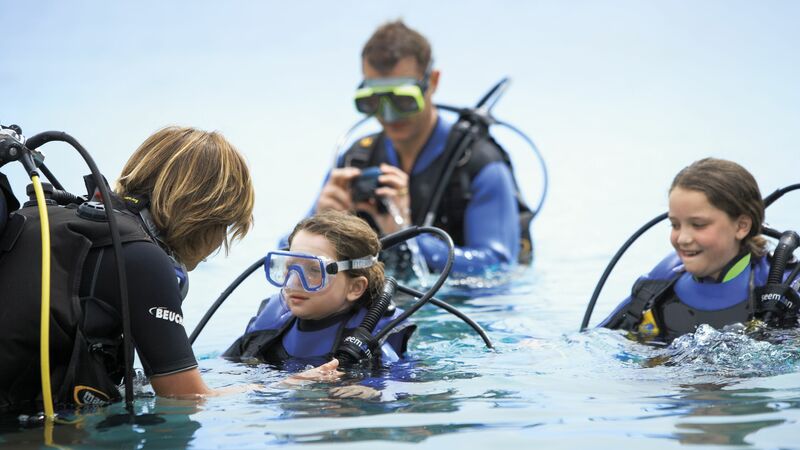 Family facilities at Daios Cove Luxury Resort & Spa include babysitting services (for an extra charge), an outdoor playground, separate section of the pool, high chairs in all restaurants, toys and games, and a child friendly beach. The large, elegant spa features full length windows overlooking the cove, an indoor swimming pool, treatment rooms, a thermal spa suite and a luxurious outdoor cabana. Treatments include massages, facials, body wraps and scrubs. Modern cardio and strength equipment is available for guests to use throughout their stay. If you want to improve your fitness personal trainers are also on hand to create a new programme for you after using diagnostic equipment and a full body scan to get to know your body. Expert staff will lead you through a series of poses to improve strength, flexibility and provide a sense of wellbeing. Classes can be held with other guests or on a one to one basis. 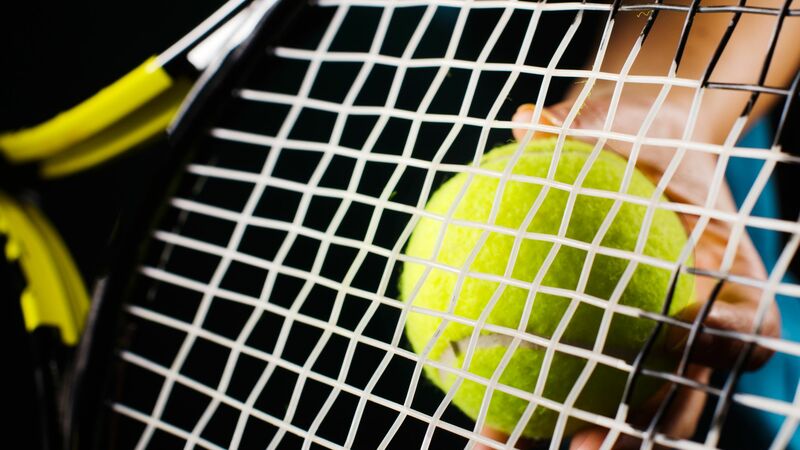 There are two tennis courts and equipment available to rent from the hotel during your stay. The water sports centre in the hotel’s private cove allows guests to try kayaking, canoeing, pedalo rides, stand up paddle boarding, sailing and even scuba diving. Immerse yourself in the culture of the island with a selection of activities. Guests can try traditional cooking classes, wine tasting, and live music evenings. 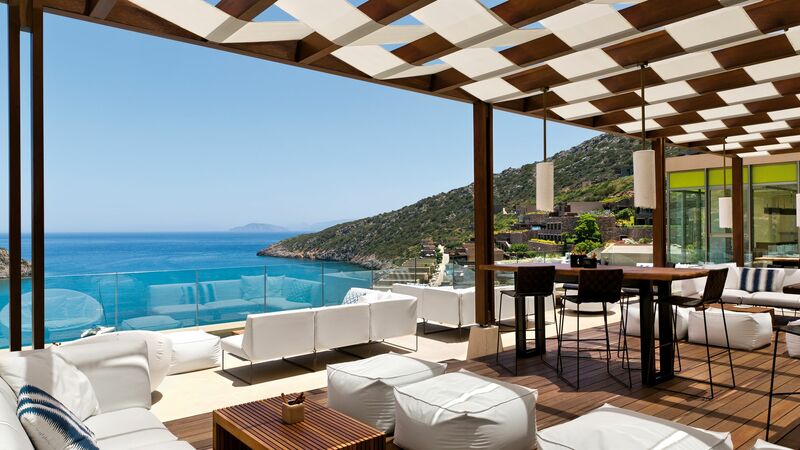 Daios Cove Luxury Resort and Villas can be found on Crete’s north east coastline, close to the town of Aghios Nikolaos. This bustling town is one of the most picturesque on the island, with colourful Venetian buildings surrounded by the sparkling sea and beautiful lagoon. Enjoy delicious cuisine as you overlook the lake, or pick up unique fashion, souvenirs and gifts in one of the town’s many boutiques. There are plenty of golden sandy beaches dotted along this stretch of coastline, giving you opportunities to spend days soaking up the sun or try some of the water sports available. If you want to immerse yourself in the area’s history, listen to the tales of the lake, which is where the goddess Athena is said to have bathed, or visit the archaeology museum. 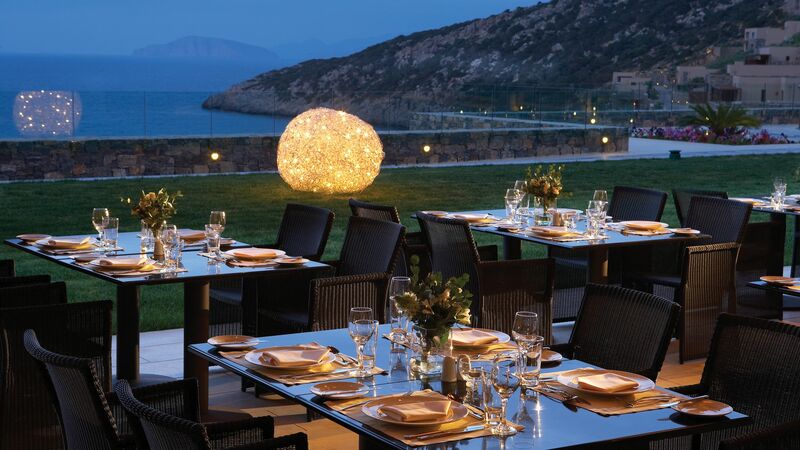 Daios Cove Luxury Resort and Villas is an hour’s drive away from Crete Heraklion Airport. These elegantly designed rooms sleep up to three adults and offer amazing views of the Mediterranean Sea. They have a king-size bed with pure Egyptian linen bedding and feather and memory foam pillows, a sitting area, floor-to-ceiling windows, lavish marble-lined bathroom with a separate bathtub and shower cabin, and a private balcony. The extra bed is a roll away bed (if under 5 years old this will be a sofa). These sophisticated rooms scomprise of one bedroom and a sitting area in an open-plan style, and a lavish marble-lined bathroom with a bathtub and separate shower cabin. The private 20m² balcony leads to an individual seawater swimming pool (this cannot be heated) and offers views to the private cove and the Mediterranean Sea. A fence around the pool area is available for a supplement (on request, must be pre-booked). The extra bed is a roll away bed (if under 5 years old this will be a sofa). Junior Suites sleep up to three adults and consist of a sitting area and bedroom in an open-plan style, a marble-lined bathroom with separate bathtub and shower cabin and a generous 30m² terrace with a private seawater pool overlooking the cove. A fence around the pool area is available for a supplement (on request, must be pre-booked). Pool heating up to 25° is available for a supplement. Guests staying in a Daios Cove Suite or Villa are part of the exclusive Residents' Club - a new premium all inclusive option. This service includes a variety of premium benefits to enhance your holiday including; lunch and dinner at any of the resorts restaurants including 3 course menus at all of the à la carte restaurants, drinks and signature cocktails at the bars, a bottle of wine from a select list with every lunch and dinner, ice cream and soft drinks for children at the pool and beach bar, complimentary 24 hour room service, mini bar with branded spirits replenished daily, a welcome gift for children, dedicated concierge, pillow menu, personalised air scent with essential oils, water in suite or villa on arrival and Apivita bathroom amenities. The spacious Suites sleep up to three adults and one child and are designed to offer exceptional comfort. They consist of one bedroom, a separate living room, lavish marble-lined bathroom with a separate bathtub and shower cabin, and a private 50m² terrace with views of the Mediterranean Sea. The Premium Suites consist of two interconnecting Deluxe Rooms, featuring a master bedroom with sitting area and an interconnected open-plan living and dining area with a comfortable sofa with a double transformable wall bed which consists of one mattress but can have two separate duvets. Both rooms have en-suite bathrooms with a bathtub and a separate shower as well as a balcony with stunning sea views. In addition to the regular facilities, these Suites also offer baby phones, bottle warmer/sterilizer, kettle, baby bath/changer, baby bathroom amenities, child-sized bathrobes and slippers, highchair, pushchair, toilet seat, baby potty, food set, stool for the wash basin, complimentary welcome snack box for children under 12 years, pool fence and staircase fence, complimentary use of tennis court (morning hours) including equipment, one complimentary session of snorkelling for the family and one complimentary massage for the mother. One Bedroom Suites enjoy breathtaking views of the private cove as well as elegantly appointed facilities. They feature a magnificent bedroom with a separate living room, lavish marble-lined bathroom with separate bathtub and shower cabin and a 50m² terrace with a private seawater pool. A fence around the pool area is available for a supplement (on request, must be pre-booked). Pool heating up to 25° is available for a supplement. Located at the waterfront overlooking the cove, the One Bedroom Villas sleep up to three adults and one child. The accommodation is spread over two floors with an airy living room with dining corner, bathroom with separate bathtub and shower cabin and a 40m² terrace with private heated seawater pool on the entrance level and a spacious bedroom with additional bathroom on a lower level. Guests receive breakfast at the Ocean restaurant, complimentary pool heating up to 25°, a dedicated area on the beach, preferential bookings for restaurants, spa and activities and a farewell gift. A fence around the pool area is available for a supplement (on request, must be pre-booked). Two Bedroom Villas feature two bedrooms with king-size bed, each with its own bathroom, separate bathtub and shower cabin, airy living room with dining corner, private sundeck area with sea water swimming pool and a terrace with sunloungers and dining furniture. Guests receive breakfast at the Ocean restaurant, complimentary pool heating up to 25°, a dedicated area on the beach, preferential bookings for restaurants, spa and activities and a farewell gift. A fence around the pool area is available for a supplement (on request, must be pre-booked). Ideal for families, these spacious villas are spread over two floors and sleep up to four adults and one child. They feature two spacious bedrooms, each with its own bathroom with a separate bathtub and shower cabin, airy living room with a dining corner and 50m² private sundeck area with a heated seawater swimming pool. In addition to the regular facilities, these villas also offer baby phones, bottle warmer/sterilizer, kettle, baby bath/changer, highchair, pushchair, toilet seat, baby potty, food set, stool for the wash basin, pool fence and staircase fence, children's welcome gift, child-sized bathrobe and slippers, baby bathroom amenities and complimentary access to the Mini Club (4-12 years). Guests receive breakfast at the Ocean restaurant, complimentary pool heating up to 25°, a dedicated area on the beach, preferential bookings for restaurants, spa and activities, a farewell gift, free use of the tennis court (morning hours), one free family snorkeling session or pedalo and one complimentary mother's back and neck massage. A fence around the pool area is available for a supplement (on request, must be pre-booked). The Two Bedroom Sea View Wellness Villa with Private Pool is perfect for relaxation, offering a heated saltwater pool and sundeck area, a wellness area including a private Finnish sauna, Technogym treadmill and an oversized round bathtub. The villa comes equipped with a large living room with balcony, a bathroom with separate bathtub and shower, an outdoor rain shower and magnificent views of the Mediterranean Sea. Guests receive breakfast at the Ocean restaurant, complimentary pool heating up to 25°, a dedicated area on the beach, preferential bookings for restaurants, spa and activities and a farewell gift. The Three Bedroom Sea View Villa Private Pool is perfect for families or small groups looking for elegant comfort and space. All three bedrooms offer modern bathrooms and the outdoor area has a sundeck and private heated seawater swimming pool with spectacular sea views. Guests receive breakfast at the Ocean restaurant, complimentary pool heating up to 25°, a dedicated area on the beach, preferential bookings for restaurants, spa and activities and a farewell gift, children's welcome gift, child-sized bathrobe and slippers, baby bathroom amenities, free use of the tennis court (morning hours), one free family snorkeling session or pedalo and one complimentary mother's neck and back massage. The Mansion is a stylish and elegant hillside property that offers the very best accommodation at Daios Cove. Guests will be spoilt with 600m² of space over three floors and a vast outside area with a private heated infinity pool and sundeck, a private spa with indoor heated pool, massage and relaxation areas, Technogym work out area and staff quarters. All three bedrooms offer king sized beds and the master features a walk-in wardrobe. Save up to 40% for holidays between 16 April - 30 June 2019. Save up to 30% for holidays between 01 July - 30 September 2019. Save up to 35% for holidays between 01 October - 03 November 2019. Save up to 25% for holidays between 01 July - 30 September 2019. Save up to 30% for holidays between 01 October - 03 November 2019. Save up to 20% for holidays between 16 April - 30 June 2019. Save up to 25% for holidays between 01 October - 03 November 2019. Save up to 30% for holidays between 16 April - 30 June 2019. Single parent offer is available when staying in a Deluxe Sea View or a Deluxe Sea View with Individual Pool for holidays between 05 April 2019 - 03 November 2019 (please call our Trusted Advisers for further details). Honeymoon couples staying between 05 April - 03 November 2019 receive sparkling wine and fruits upon arrival, flower decorated bed, room upgrade (subject to availability) and a free entrance to the spa areas (treatments are not included). Minimum nights stay is required for some of the above special offers. Positives Definite 5 star hotel Beautiful setting and cove location Superb accommodation Stylish hotel with excellent facilities Excellent service and staff Half board was included on early bookings. 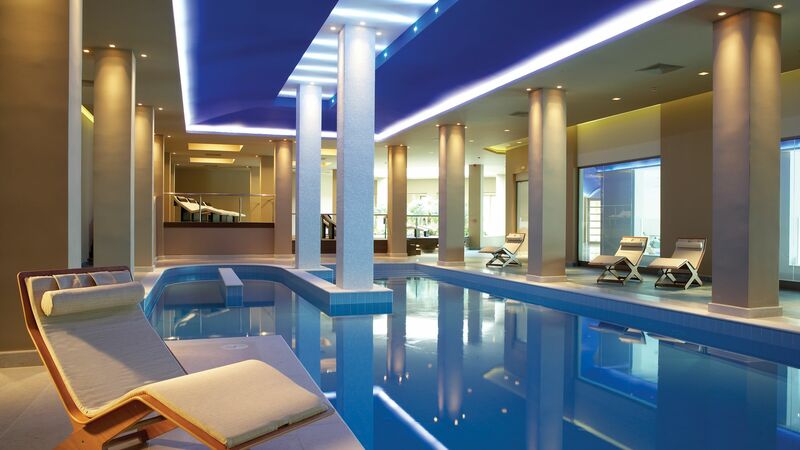 Excellent food and of a high standard Superb gym ( included in your stay) Excellent spa, top notch saunas and steam rooms. Indoor games room for children Heated outdoor infinity pool Beautiful beach cove Laid back luxe beach bar / beach club Negatives You have to pay to use the Sauna and steam room. Need more activities for children aged 9-12 Kids club only for young children Charges to play pool in games room 2Euro per game. We visited Daios Cove a couple of days after our wedding and it was the perfect getaway for couples who seek a romantic & secluded location. The staff was extremely nice and efficient and the food was very good. I'll be more than happy to come back in case we will want some quiet and relaxing vacation. We loved staying at Daios. The bay is beautiful. The hotel is so so so nice. We loved our private terrace with a view. Sat out there having a drink and chillin. We didn't leave the hotel during our stay. Decided just to stay in an veg out. I highly recommend it. The room was spacious, modern, and well equipped. Great bathroom and the views were amazing. Pool with kids pool attached and great kids club. Ideal resort for family holiday. Staff was polite and helpful, we'll be back!